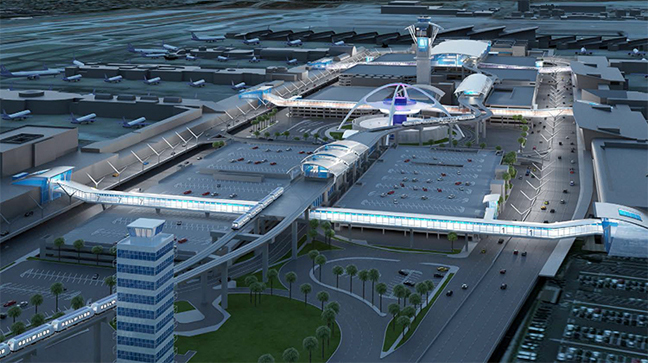 Moving forward with ambitious upgrades at Los Angeles Inter­national Airport, city officials are in the initial stages of soliciting construction companies to bid on contracts as part of a $5 billion modernization effort that includes a people mover and a rental car facility. Los Angeles World Airports, the city agency that operates LAX, will hold a networking meeting Feb. 4 for potential bidders for the Landside Access Modernization Program. The project includes the construction of a 2.25-mile automated people mover, a consolidated rental car facility, transit hubs and roadway improvements. LAWA has spent $4 billion since 2007 on projects to modernize LAX, including a major overhaul of the Tom Bradley International Terminal.